Not only is Red Stocking Breakfast a holiday tradition in Liberal, but funds raised benefit three long-standing programs in the community, Early Head Start, Head Start and Healthy Families. 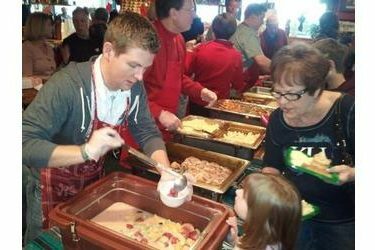 While these programs are federally or state funded, and may receive additional support from United Way and other grant sources, both rely on the Red Stocking Breakfast funds to serve their area. Red Stocking Breakfast is KCSL�? ?s signature fundraising event. This year�? ?s event will be held from 8:00 to 11:00 a.m. on Saturday, Dec. 12, 2015, at the Liberal Country Club, 339 W. 18th Street, Liberal, KS. All proceeds will help support KCSL�? ?s Seward County Prevention and Education programs. Tickets are $10 in advance or $12 at the door (children age 10 and under eat free). Advance tickets are available at Spencer Brownes or online at www.kcsl.org. The event venue is sponsored by the Liberal Country Club; 100 percent of the funds raised benefit KCSL programs and services. The event features a breakfast buffet served by local �? ?celebrities.�?� Attendees also have a chance to win some great prizes.